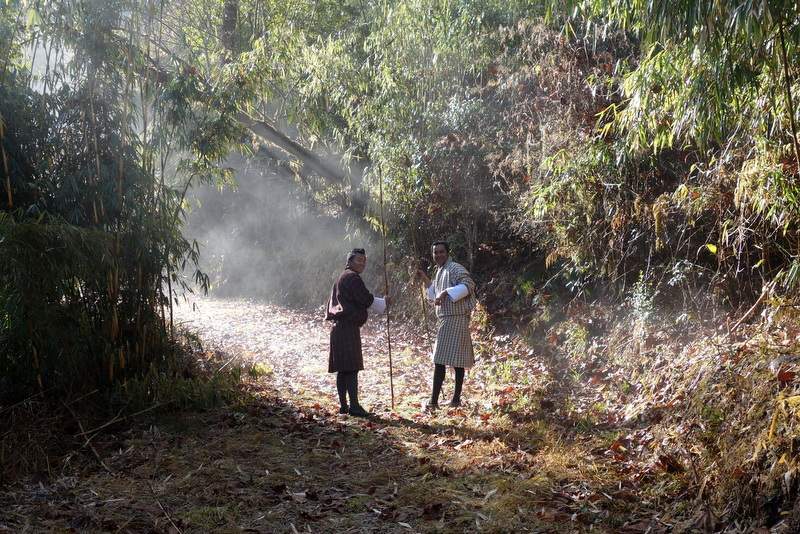 In an effort to be affiliated to a new project at the university, dealing with the in vitro propagation of endangered plants from the foothills of Himalaya, I found it necessarily to make a expedition to those locations, Bhutan being one of them, Nepal, Bangladesh and northern India others. 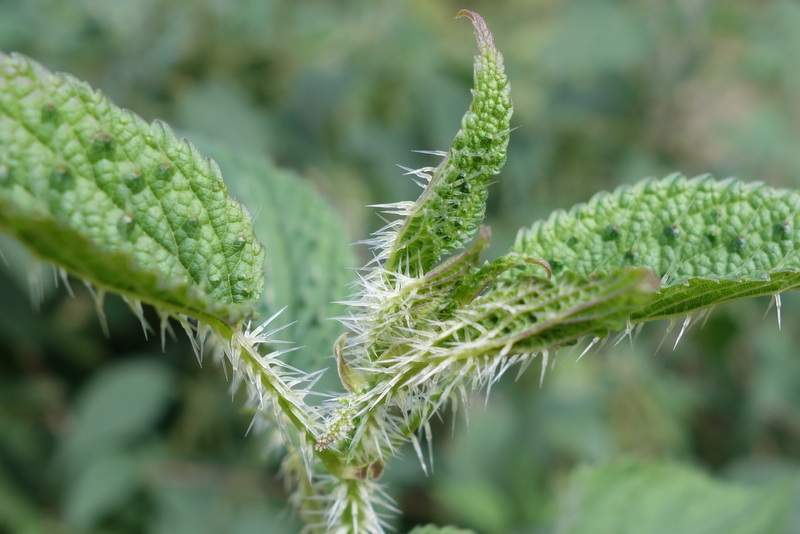 While literature list various characteristics within the flower, they fail to list the growing conditions for these plants. That is what I need to know, and it seems like visiting the original habitat, is the only way to learn. 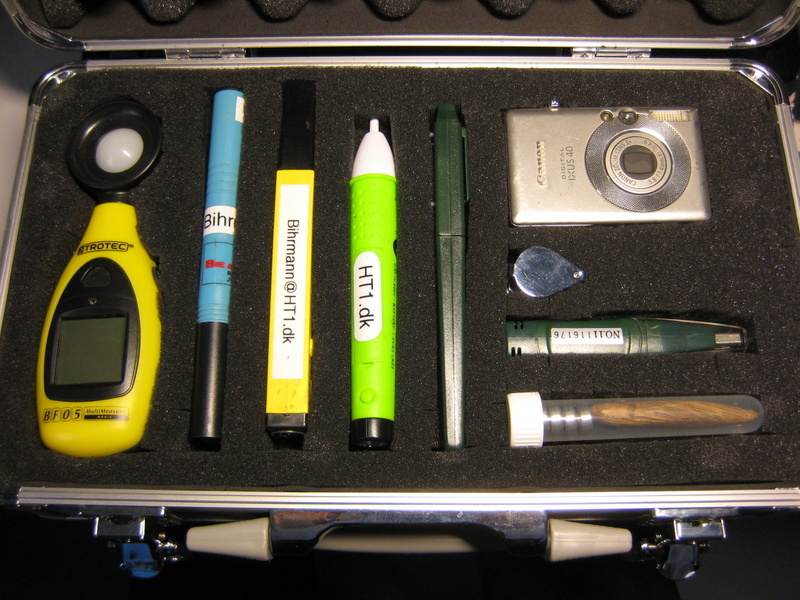 I will be able to observe, measure, learn and understand their preferred conditions in the wild. I will analyse light, pH, humidity and concentrations of nutrition along with other factors like ventilation and animal interaction. This is a very little studied subject, and with the array of species found in a relative little but climate diverse area, this area offers a perfect study. I hope to be able to visit the wild and unspoiled nature along the road. However, the way Bhutan tourism is made up, it seems like I have to go from temple to temple. On the other hand; this is a rather unspoiled country, and I hope I will find nature in close proximity to the places I stay. Further more, I have found an agent who takes me into the wild. The Kingdom of Bhutan is a rather small and real undisturbed country between China and India. It covers 38.394 km2, measuring roughly 200 times 300 kilometres, although it feels significantly bigger, driving its roads! Bhutan is the only country to have officially adopted "gross national happiness" instead of the "gross domestic product", and that thought is real appealing to me. In an effort to maintain the country's cultural values, foreign visitors are restricted. Not directly in numbers, but by the visa fee. At present, the fee is $US 200/250 + $US 40 for singles - a day!. That does include most things like guide, transport, food and accommodations. Of the 750.000 citizens, 75% practise Vajrayana Buddhism, 22% are Hindi the rest dividend in-between and a few others religions. MONEY: The currency is Ngultrum, fixed to the Indian rupee, which also can be used:100BTN = 1,27€ and 9,45DKK. I recon dividing with 10 provides me with a roughly price in Danish Kroner. CLIMATE: The terrain is some of the most rugged in the world, characterised by huge variations in altitude: 150-7.500 meters! 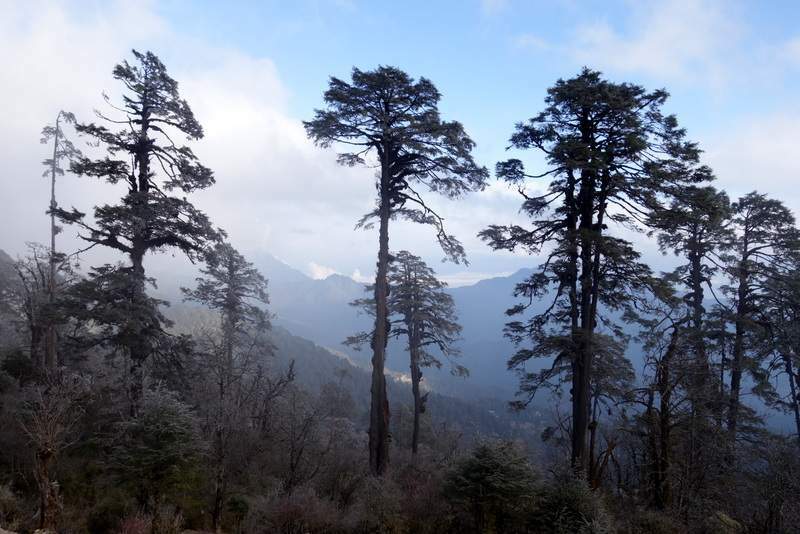 That make Bhutan's landscape ranges from subtropical plains in the south to the sub-alpine Himalayan heights in the north, where some peaks exceed 7,000 metres. Where the warm south is the fare most populated and interesting for me, the northern part is truly wild and unexplored. The government has enacted a law that shall maintain at least 60% of its forest cover for all time. 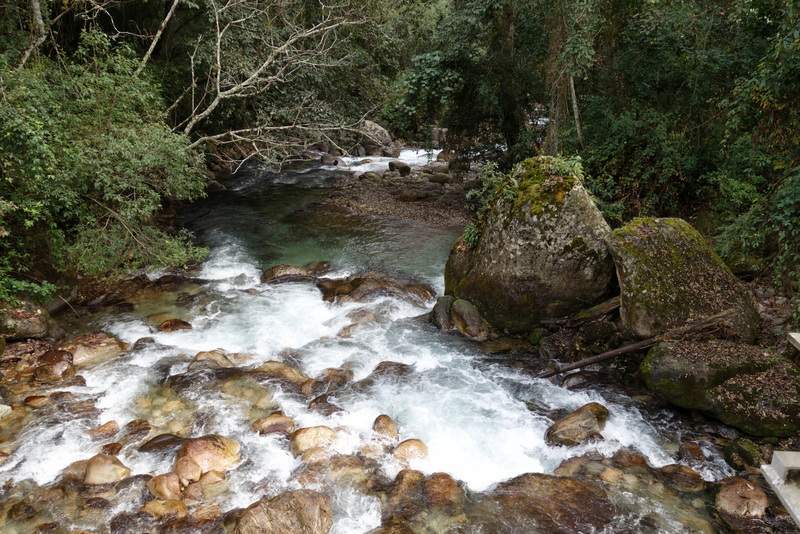 Today, approximately 70% of the total land area of Bhutan is under forest cover, and approximately 51% of the land area falls under protected areas comprising of 10 national parks and sanctuaries. The size of the country considered, that make lots of room for the Bengal tiger, greater one-horned rhinoceros, clouded leopard, wild water buffalo, hispid hare, the sloth bear, grey langur, Indian leopard, goral, serow, black bear, red panda, squirrel, sambar, wild pig and barking deer. In the heights, the snow leopard, blue sheep, marmot, Tibetan wolf, antelope, Himalayan musk deer and the takin can be found. There are 90-200 mammal species in Bhutan, and more than 770 species of bird. More than 5,400 species of plants are found, most occurring in the warmer, southern part. GETTING THERE: The national Druk Air have routes from the nearby countries. It has to be mentioned: "Druk" means "drunkenness" or "boozing" in Danish! There is a border crossing from India in Phuntsholing, but it seems like the mandatory guides insist on brining you directly to Paro, near the capital Thimphu, instead of an eight hour drive. Considering the visa fee, I just to fly in, and save a day. 6/1. Flying in from Nepal, in 7500 meters height, way below the peak of Mount Everest, but along that mightily mountain chain. The valleys below us is a sea of clouds, but the range of giant peaks stands clear, right outside my window. 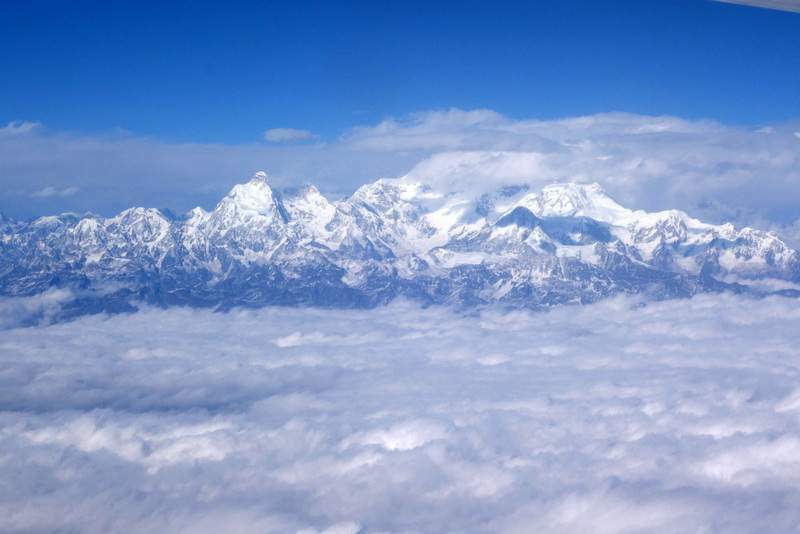 The peak of the true giants, above 8600 meters are covered in their own clouds, but is is still a fantastic sight. 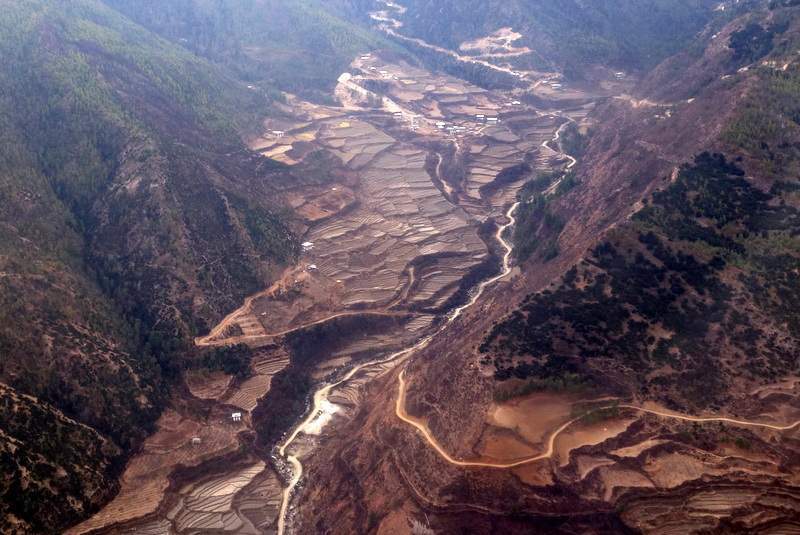 The in-flight to Paro (elev. 2200) is amassing. It is clear, and the mighty mountains and hills are clear, and each pinetree and terraces can be seen, along with their special, huge houses. All seems to be in two stories, all a bit like Swiss alpine huts with loads of decorations. And it is a bumpy flight, in-between the hills and mountains! I'm the first in line for pass and then custom, and first out of the magnificent airport building. I find my guide and my driver, which are wide-smiling younger men, with a good English. They can't pronounce my name, and I tell them to call me "B", but it end up with Sir. I am sure we will get some good time together. The car is a almost new minibus - with heat! They both are warring national suits - which seems to be mend for summer, and we can easily agree on a warm car. It is a hour drive to the capital; Thimphu (elev. 2400), on a almost deserted, but never the less; well maintained highway. The speed limit is 50 km/t, but fine with me: The surroundings are breathtaking. Massive hills and mountains with pines, a crystal clear river in the button of the cliff, white peaks to the horizon and these decorative houses scattered lightly around. I tell them a bit about what I am interested in seeing, and we skip the National institute of traditional medicine services right away - it might be closed anyway. We reach the tiny capital, which is beautiful. The building regulations are strict, and even Tata and Toyotas new sale houses fit in. We drive straight through, to reach the Kuensel Phodrang or the Buddha Point, which is the world's largest sitting Buddha statue. The statue is 51 meter high, and it will house a temple inside. The statue is situated on top of a hill overlooking Timphu. The word Kuensel means "everything is clear" and from this place is great view of the Thimphu Valley. The statue is constructed out of bronze and cupper and is studded with many semi-precious stones and even a large diamond in the forehead. 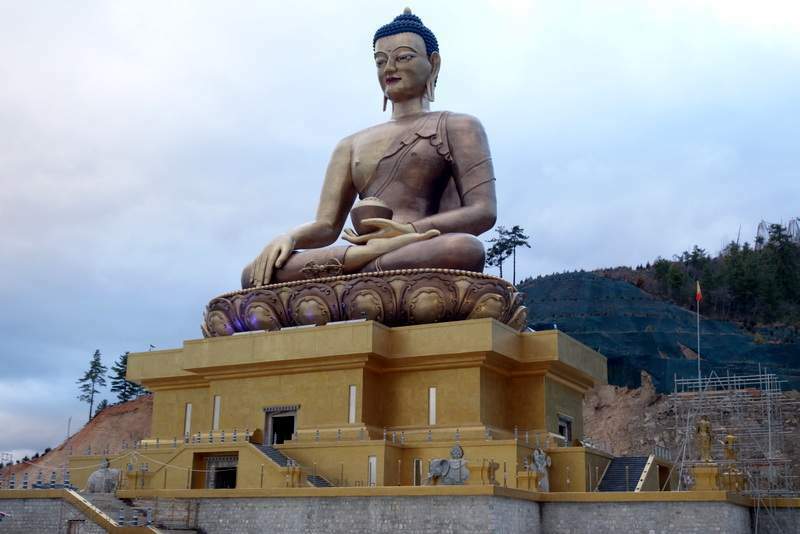 Since they are no factories in country that can make such a large bronze cast structure, it is being manufactured in China and the pieces are brought to Bhutan and are assembled here. The statue is finish, but the temple and the entire area is still being build. A real kitsch adding is a few, coloured and flashing lamps at the base. On the drive to the statue, the steep winding hill road offers an unparalleled view of the city of Thimphu, which the recent years has started to spread into the side valleys. I only get to work for a few minutes before a young and funny Indian girl turns up. Her Indian-English sounds surprisingly much like Swedish-English. She has been in Sikkin - northern province of India, and it is fun to hear her tell of that. Despite they all Indian, her and her boyfriend was being taken photos of, asked for signatures and in general treated as freaks or movie stars. As she self put it: No where else in the world would two Indians cause that commotion. We talk for a hour, then my supper is served. Only one thing pops into my mind in the dining room: I am not worthy! The waiter places the napkin in my lab, and start serving pumping soup, fresh salad, hot pasta salad, roasted chicken and ice-crème. And I'm alone! I ask to have the tea served in the lobby, next to my new, best friend (no, not her: The fireplace!). Despite the real nice and warm room, I am having a hard time sleeping. My alarm set for 6:10 is one major factor, distant dog's hauling another. I get up real early and start working on some thoughts about how to grow plants - way beyond the way NASA does. 7/1. My "handlers" are a bit late, but it is cold outside anyway. It seems like it has been frost this night, and it is still a crisp air. This valley is filed with naked apple- and cherry trees, and it must look fantastic in the spring. Like Nepal, it is either the cold or the rain. 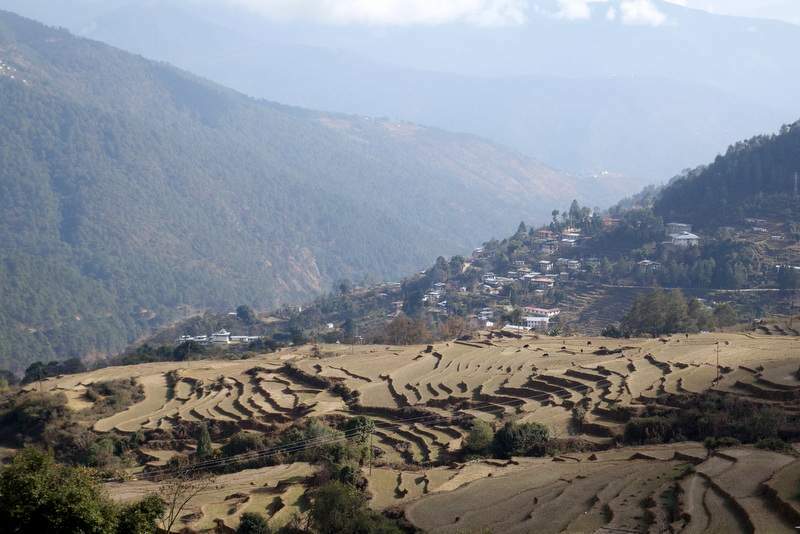 Bhutan's industry is located way down south, in the lowlands, where the pollution is less effective. Their lowland is 300 meters above sea, and they have no coastline, just squeezed in-between China and India. And kind of only open to India. We head straight towards Serbithang, because the road will be closed for two hours due to road-works. On the way, we pass the big power station, feeding the entire western Bhutan . It is a waterpower station, and more are being build. That way, Bhutan can gain a nice income from selling electricity to India, and of the cleanest form. We pass endless forests in steep gorges, small apple stands, the white river in the button and as we assent: White trees on the ridges. Look most like snow, but it could be icing. I make a lot of desperate photo attempts out the windows, and we do several stops too. It is still misty at Dochu La Pass which is 3140 meters and covered in praying flags. On a clear day, the entire Bhutan Himalaya can be seen from here - that is not today. The sun breaks trough in small spots, but the clouds refuses to give up. 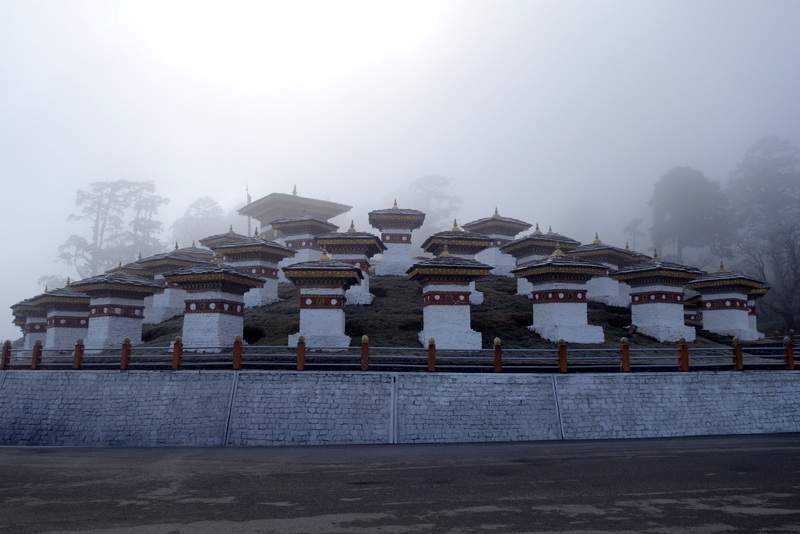 Next to the pass is the beautiful but strange Druk Wangyal Khangzang Chortens, built as a tribute to the Kings of Bhutan for their selfless service and leadership they offer to the people of Bhutan. It is a gathering of small temples on a hillside. From here, it is significantly more moist, and the oak, maple and blue pine is changed into Rhododendron, alder, cypress, hemlock and fir. They are covered in lichen, mosses, ferns and quite some orchids. The road keep twisting in and out of gorges, and new lookouts passes constantly. When we reach the entrance to The Royal Botanical Garden in Serbithang, about 15 kilometres from Thimphu, it is closed. The 12 hectare garden, which was established in 1999 is still being developed. The garden is managed by just nine people, but it has an exchange programme with the botanical garden in Edinburgh, Scotland, which should help upgrade the knowledge and skills in the development and management of the garden. The purpose of a botanical garden is not just to amuse people, but that it serves a greater purpose of educating, conserving and researching. As other botanical gardens, the plants has records of where it was collected from, who collected it and when it was collected. Therefore, the most important and interesting aspect of a botanical garden is its educational impact. Right inside the unlocked entrance, some big, old roots are home to a great collection of epiphytic orchids. Pema has promised to introduce me to the manager of the garden, and I wrongly assume we will be back here. Bhutan should be home to 430 different species of orchids, and I have seen at least ten by now. Flowers would add considerable to the list, I think. A big lake; Bartisho is like a mirror, in which the mountains and huge trees mirror them self. A bit of ice in the edges, and some icing on the grass, but the lack of wind and first beams of sun make it quite nice. The next collection is many of the 46 species of Rhododendron, found in Bhutan. The office and guest buildings are beautiful buildings like elsewhere in the country - but empty. We reach a small but well displayed shadow-house with more orchids and some ferns and lichen. Pema tell me; his tribe eats them as a replacement for meat, and he loves them. Back in the wild, I find some other orchids, and a lot of fantastic panoramas. We are still alone, and leave by a back door. As we start the tour back, I see some epiphytes which MIGHT be Agapetes serpens: The plant I most of all wanted to see. Ever since I first read about it, and the line "found in the foothills of Himalaya", I have wanted to find it. I get Bishnu Lal to toss the car, and run back: IT IS! The caudex is covered in mosses, and it sit high up in a tree. It is a member of the Heather-family which have adopted till this strange habitat. After a while, I spot what could be a large plant with exposed caudex, and Bishnu Lal get another chock. It is a fantastic plant, and despite the strong light against, I get some descent photos. I tell Pema: It has been a great day, we can return to a hotel. We don't. Instead, we walk down for some time, finding more Agapetes, orchids, fantastic views and even a flowering, red Rhododendron! As we reach the lower areas, rice terraces dominate the lover parts of the hills. We stop several times for photos and short walks, before we are stopped again. It is another road work, blocking the road for the next hour and a half. 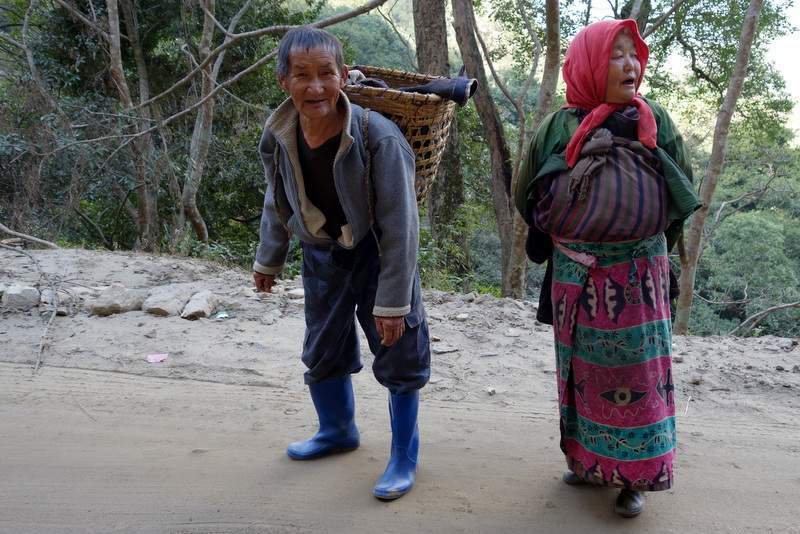 Pema and I start walking downwards, and soon, I spot two giant beehives, high up on a vertical cliff-wall. A bit further down the road, some more of the small offerings sit on a cliff shelf. Look like clay-offering lamps. Some of the locals are out walking. It seems like beetlenuts are popular here. Bad teethes and red gums and lips, and I did actually notes the spitting earlier on several occasions. The traffic runs again, and Bishnu Lal pick us up. Next stop is a brand new, traditional house, housing a restaurant in Punakha, found in a low and warm valley. Pema & Bishnu Lal think I want to sit and eat alone, but that not going to happen. We share our food at one table, in one room, and I learn a bit of their diet. It taste great, but it is tourist modificated ... They eat meat, and Pema have given it some thoughts. Buddha eat meat, and one of the highest ranking monks told him, it was no problem, as long someone else did the killing. Eating the animal afterwards was a way to show your gratitude. Pema, who is a devoted Buddhist, try to explain a lot of the basic Buddhism to me, how it is so integrated in Bhutan culture and how it all started. 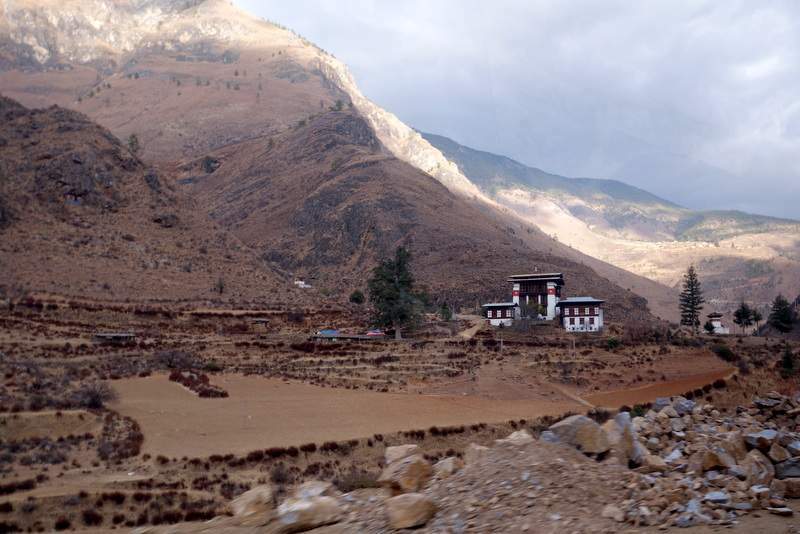 We pass the huge fortress of Punakha Dzong, but it is not open yet, and we head on to Jigme Dorji National Park. 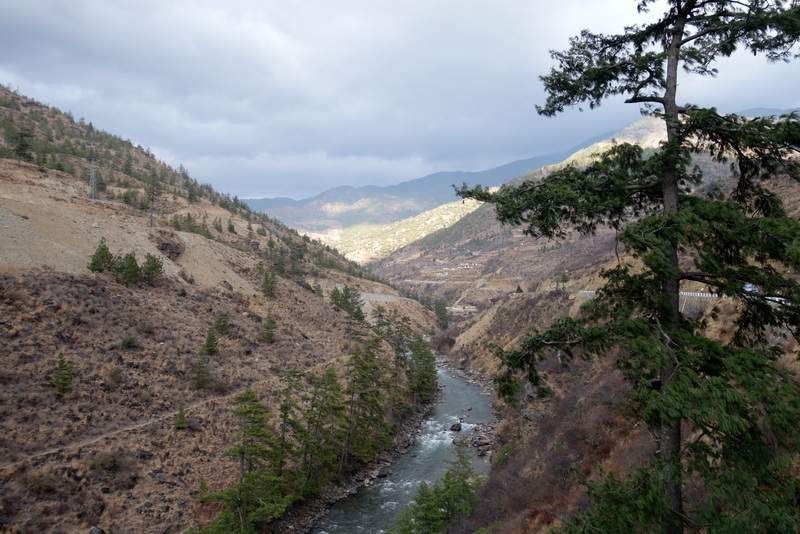 Is Bhutan's second largest national park with 4316 square kilometres. 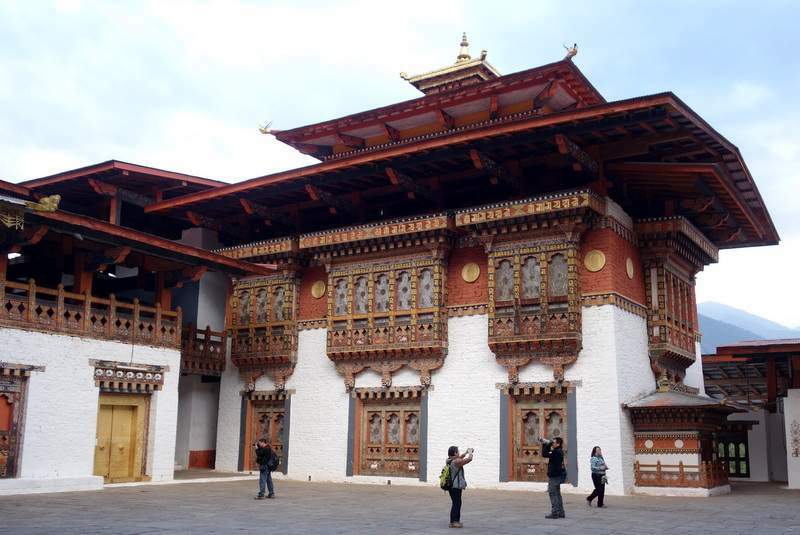 It is named after the former King the Jigme Dorji Wangchuck. 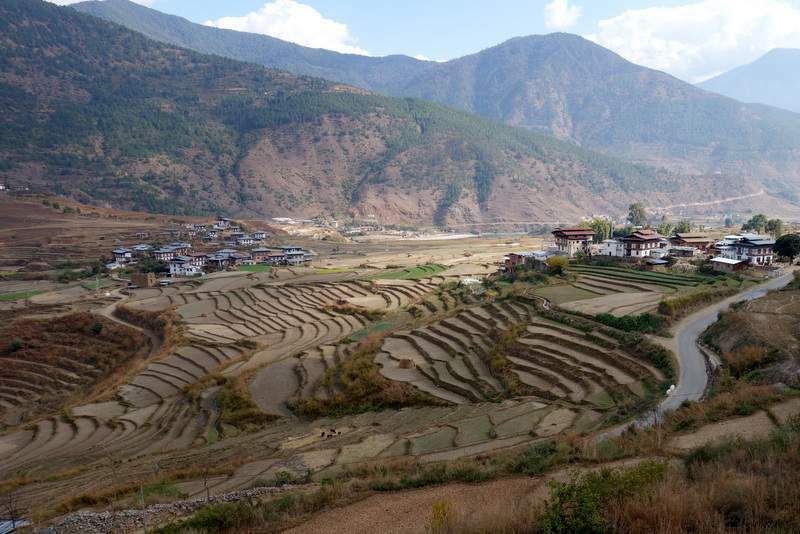 The park essentially occupies almost all of the Gasa Dzhongkhag as well as parts of the Punakha Valley. 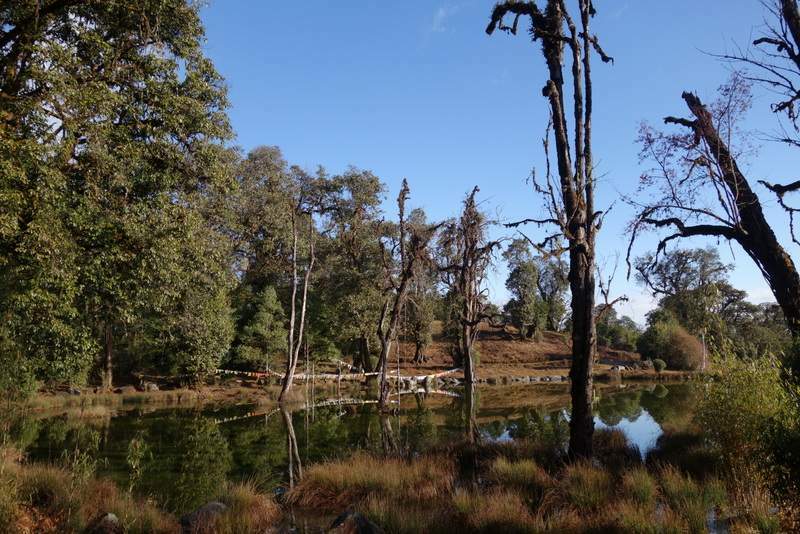 The park interesting cover the three major altitudinal zones of Bhutan, at its lowest the park has an elevation of 1400 meters above sea level and at its highest about 7000 meters. The park is home to 37 species of mammals out of which several are listed as endangered on the ICUN red list. Here are Takin, Snow Leopard, Clouded Leopard, Royal Bengal Tiger, Himalayan Blue Sheep, Black Musk Deer, Himalayan Black Bear, Red Panda, Indian Leopard, and Pica. The Jigme Dorji national park is also home to over 300 species of birds including the Tibetan Black Necked Crane. Well, we do see some small birds and a boy who is cutting firewood. Many of the orchids sits low, and I even find one which I can't set genera on. Pema, who never have had a plant before, is somehow being inspired - or contaminated by my enthusiasm, and nick an orchid for his home. Well, I get along with photos. Here are some vulgarly looking Urticaceae, and I keep my fingers to my self this time! On the way back, we find a lot of wild, young Cannabis sativa plants. The drive to and from the park is fantastic. As every other road in Bhutan, is follows a river. Is passes scatted houses and a few local people, some having an bow and arrow contest. A few small horses, evenly small black cows, black dogs and a cat crosses the road. The last make Bishnu Lal back-up a meter - just to prevent bad luck. We make a stop at one of the many water-driven praying mills. The sun has given up for the day, and my photos tend to be rather desperate. Then we are back at the huge Punakha Dzhong or the Pungtang Dechen Phortang Dzhong, located at the confluence of the Mo Chhu and the Po Chhu River, combine to form the Puna Tsang Chu which in turn is a tributary of the mighty Brahmaputra River. 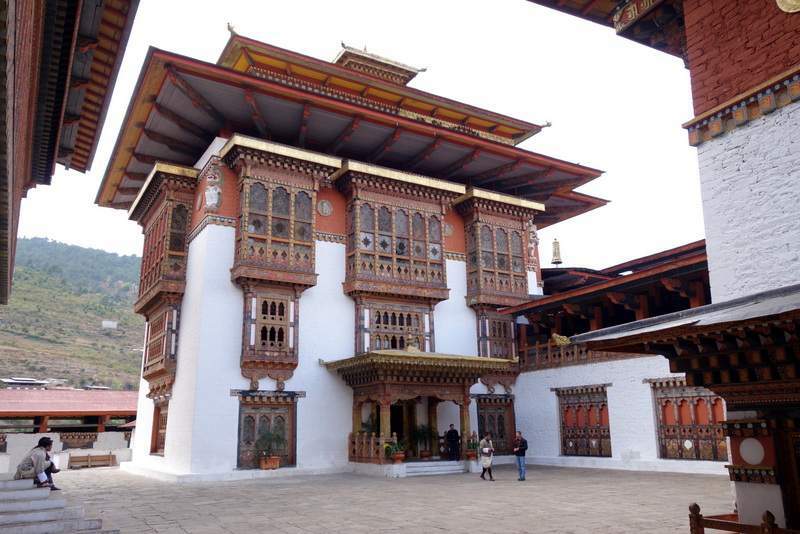 The Dzhong was constructed by Sahbdrung Ngwang Namgyal Wangchuck in 1638 on the exact spot as prophesized by the Guru Rinpoche some 800 years ago. According to the prophecy of Guru Rinpoche "a person named Namgyal will arrive at a hill that looks like an elephant". And lo behold! Shabdung Ngawang Namgyal found that the peak of the hill was in the shape of an elephant's trunk and built the Dzhong at that very spot. It is home to the sacred mortal remains of Shabdrun Nagawang Namgyal and Trenton Pema Lingpa the great treasure discoverer of Bhutan. 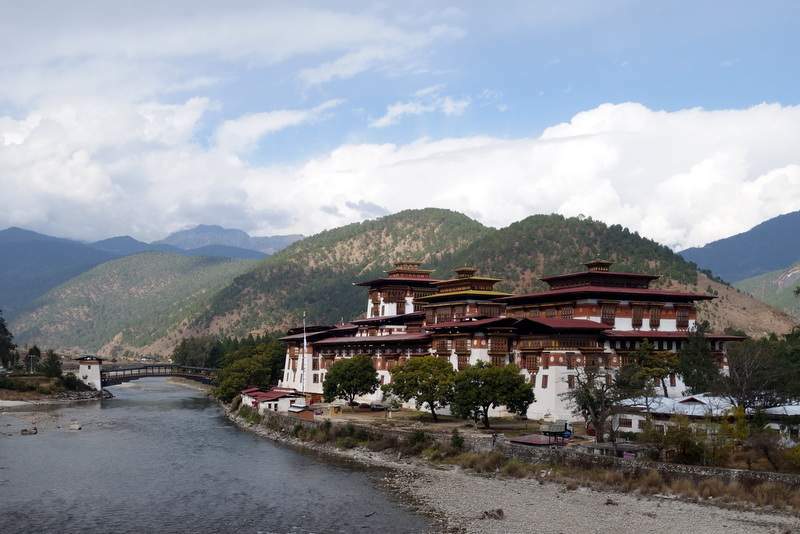 The Punakha Dzhong has also served as the of capital Bhutan till 1955 before the capital was moved to Thimphu. 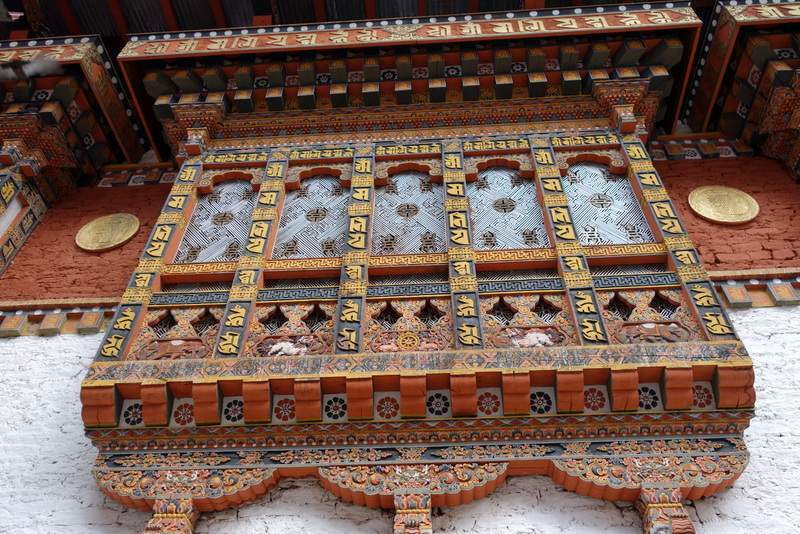 The Dzhong is still the winter residence of the Je Khenpo (chief abbot) and the central monastic body. I will not try to describe this immense building - well: It is big, magnificent decorated, well maintained, beautiful and impressive. Pema explains a lot of the details to me. In a giant hall, way back in the cluster of buildings, the most holy of Buddhism is found. It is a magnificent room which is completely decorated. Gold colons, bright silk draping, massive statues and extreme detailed drawings on the outer walls. Some showing Buddha's earthly life. It is so interesting to hear Pema tell all this with his enthusiasm and knowledge and at the same time: Love. And it is great to have a guide who only tell about the things I want to hear! Pema & Bishnu Lal, who both are warring the traditional Bhutan suits, has here to add a long, wide cloth - kind of a tie - but worn over one shoulder, across the chest in a complicated way. Bishnu Lal never get it right, and fight with it, the entire time. Despite is is not five yet, it is getting darker, and Pema & Bishnu Lal calls it a day. One part of me wanted to see more, another know I have photos enough for one night - and the light is fading too fast anyway. 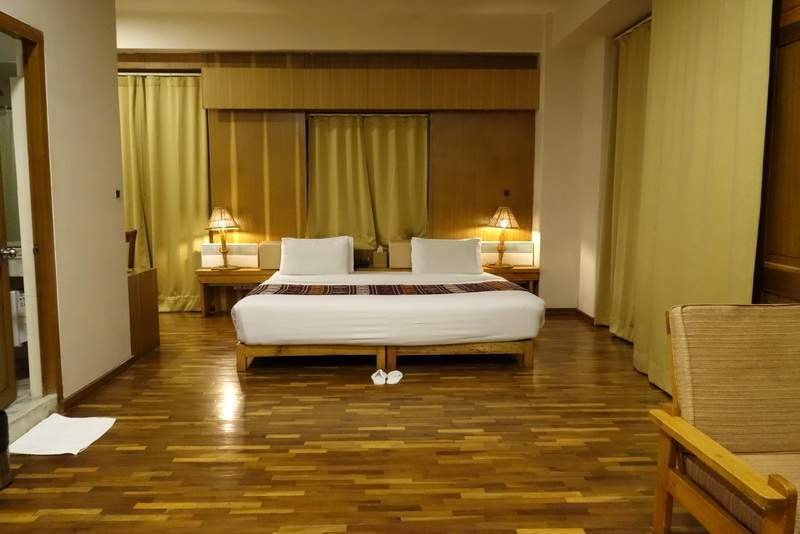 We drive to a new hotel in Wangdue. We passes a small marked on the way, but it seems like apples are almost the only crop for sale by now. Pema & Bishnu Lal disappears after having checked me in at Puna Cottages, but returns a hour later in western clothing. They just want to say goodbye, and disappears with another guide. I get my supper served, all by my self. A starter in form of a chicken soup. Then seven plates with vegetables in different states of spice and steaming, plain rice, fried chicken - with splinters of bones as usual, a rich sauce, some puffed-up brads and a delicious tofu, matching many of the pork-dishes I have had recently - honestly; it was better! Then, it is back to the computer and the 374 photos of the day. Many suffers from the lack of light, combined with the movement of the car. While I continues my work, a family of Indians start dining next to me. Apparently, they lack lips, just like Chinese, and I appreciate the fact, I have finished eating. When the staff politely tells me, I got a room, around ten, I am a bit disappointed. It is not warm, and there are no WiFi. At least, here are some of the rubber bags and hot water. I keep working till after midnight, and once again, I promises my self: Les data, les photos.... I ought to make some slideshows, but I can't figure a logical way to divide them into series. Day 1+2? The epic journey should have continues in Diary 2.